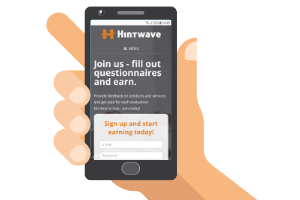 You can supposedly join HintWave and earn by filling out questionnaires. But is HintWave legit or a scam survey site? I have joined and tested the site myself to see what it really offers. In this HintWave review, I will show you all the details and give you an inside look so you can see exactly what you get as a member and easily decide if it will be for you or not. What is HintWave and what does the site offer? HintWave explains what it is a bit differently than most other similar sites I have tested. It says that you can fill out questionnaires and earn. What this means is that it is a paid survey site where you can get paid to share your opinion. Before I join and test any sites like this, I always like to look into who is behind a site as this can tell something about the credibility of the site. When it comes to HintWave, there is not much information to be found. In the about section, you can just see it says it is a company that builds and delivers professional online research panels. It does not say when it started, where it is located, or any details like this. From looking at the language of their Facebook page and on the contact page, it is, however, possible to see the company is located in Poland. So good to be able to see it is a company with a physical address. Anyway, there is not much other info to be found before joining but I still decided to join and see what was on the inside. So here are the options you can get access to as a member of HintWave. HintWave is, first of all, a paid survey site and taking surveys is the main way to earn. When you become a member and login, you can see a list of available surveys. Or that is what you in theory can. However, I have not seen any available surveys. In my dashboard, I only get a message that explains there are no available surveys. This was the only message I saw in the survey dashboard. It is formulated quite strangely as you can see on the image above. But that was all I could see in the survey section. They way you will then get access to surveys is via email. So once you have signed up, you will start receiving emails with survey invitations. Not a lot but there will be some. The number of surveys can, of course, be because of the country I live in. So I cannot say for sure that it will be the same for you. Maybe you will get access to more where you live. But in my experience, it is not a platform with a lot of survey opportunities. Another way you can earn on HintWave is by inviting friends to join. You can invite them either via email, share on Facebook, or share a link where you want to. You can earn by inviting friends. This can be a way to earn a bit extra on some survey sites, in general. I am, however, not impressed with the option on HintWave. For you to earn, the person you invite has to complete at least 3 surveys. Then you will get £0.80 into your account. This is a very low reward for inviting a person that needs to complete 3 surveys. In addition to this, before you use this option, you need to look at the amount of surveys available to you. In my case, I, for example, do not have access to any. So I can figure out that it will also not make me any many to invite any of my friends as they will not be able to take 3 surveys so I could get paid. So in theory, it is a way to earn a bit extra on HintWave, but you should not expect it to be a way to make a lot of money. Inside HintWave there is a button you can click where it says you can earn 4 x more. You can supposedly earn 4 x more by clicking this button inside HintWave. But the way it works is that it is not on HintWave you will get more earning opportunities. The button is actually a way for you to sign up for several other panels at the same time. Usually, when there are options like this, you can click and then choose the panels yourself. On HintWave I just clicked and then within minutes I had several emails in my inbox from other panels saying that I was now registered for them. I was suddenly registered for 3 more panels. That was a bit of a surprise and I felt it was a bit overwhelming to just get 3 emails like that without having been able to actually click the button and read more about the option first. So another thing that was a little strange to me. And not really a way for you to earn more on HintWave. It is more a way for them to earn by getting paid by the panels they refer you to. 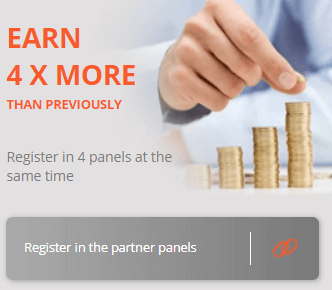 Now you know what kind of earning opportunities there are on HintWave. But it is also important to know how you can get paid. This is another thing where it is not easy to find information on HintWave. But in the reward section, it does say that you can transfer the money into your bank account. It was, however, not possible for me to find any info about when you can withdraw your earnings. All you can see about this is in the FAQ section where there is a question that explains you have to collect a larger amount. You apparently have to wait until you have a large amount collected to get paid. It does not say what a larger amount is and it worries me that this is not clearly stated and that they say it has to be a larger amount. They explain it is because it allows them to then offer you higher rewards (or salary as they call it). But this is a poor excuse, in my opinion. 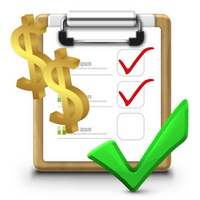 The quickest paying survey sites can all pay out very fast – on some, you even only have to earn $1 to get paid and you can do that more or less right after joining. So the payout conditions on HintWave definitely concerns me. Honestly, I am not sure if it is possible to really earn on HintWave. It has not been for me. There are some surveys via email but not a lot. But maybe there are more surveys available in your country. However, no matter what, you should not expect big earnings. So if you are lucky it might be a way to earn a few £/$ here and there but from what I have seen it will not be much. And with an unknown payout threshold that supposedly has to be large, it might be a risky choice or at least require a lot of patience to get to the threshold. It is great being able to use survey sites on mobile so you can earn on the go. HintWave can be used on mobile as the site is optimized for mobile and is pretty easy to use there. However, it will not give you more opportunities. It will just give you access to the same things but by logging in on your mobile. 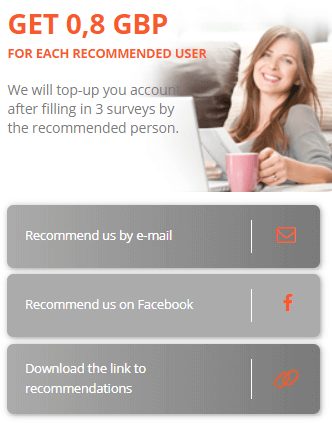 So if you do not have any available surveys on desktop, you will also not have it on mobile with HintWave. HintWave is restricted to certain countries. At the bottom of their website, you can see which countries it is available in. The countries HintWave is available in. In each of these 15 countries, it is available in the local language. However, no matter if you live in one of these countries or not, you should, in my opinion, check out the best survey sites in your country instead as there are many sites with more and better options. If you need support from HintWave, it looks like you can get it. On the website, you can find an email and address by clicking on the “contact” tab in the main menu. It does not say how quickly you can expect an answer. And since it is a panel I have decided not to spend any more time on, I have not been in contact with their support myself, so I cannot say how responsive they are. 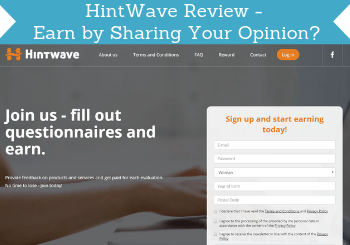 From what I have seen and been able to find out, it seems like HintWave is a legit site since it shows its address on the website and is a real survey site that sends paid surveys after you join. But there are definitely some things that concern me about the site. So I hope this review has helped you get all the details to make an informed decision about whether it is a site for you or not. To help you get a better overview before deciding, let’s finish by summing up the pros and cons. Overall, HintWave might be a way to earn a little extra if you live in a country where it offers regular surveys. However, my biggest concern about it is that there is no info about the exact payout threshold and all you are told is it has to be a large amount. A survey site should clearly state the payout conditions so you know what to expect and how quickly you can earn enough to get paid. For this reason and because of the limited opportunities I found on the site, it is NOT a site I recommend when there are so many other great survey sites. You can, for example, check out the best survey panels in your country here. All of them have more opportunities and clear payout conditions and are, in my opinion, a better use of time. If you have any comments, questions, or have any experiences with HintWave yourself, I would love to hear from you in a comment below. HintWave seems like a legit survey site. But there are some big minuses about the platform as well. Especially that they do not clearly state the payout conditions and all you are told is that you have to collect a large amount to cash out. This is not good enough and not having more clear conditions are a deal breaker for me. Therefore, I suggest you to join other survey sites instead.